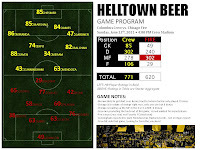 I've been working on Crew game programs now for a few weeks. One one hand it's fun for me because it's a way for me to put my player ratings to work and keep up with with injuries and probable line ups. On the other hand I put it together because I was a tad frustrated with the official programs that the MLS puts out about a 48 hrs before each game. Missing info and generic formations. Because my program includes player ratings it is tempting to use it as a predictor to final outcomes. It is not that. My player rankings are too influenced by playing time to use it as such. I do have separation outside of PT though. Offensive productivity is one. Another couple drivers are how well the team is doing overall. Not directly influenced by wins and losses but by goals against and goals for. Better defensive players in the league show higher scores due to the entire team's GA. It's also about relationships between the teams. If a player is on a bad team and getting a lot of minutes he suffers in my rank a little. An example of this right now is Chicago's Logan Pause. He has more minutes then both Dominic Oduro and Gaston Puerari for the Fire but he he ranks below both of them. Most of that due to fouls conceded. The weight put on fouls is light, but if a player is chopping guys down too much in relationship to his team and the rest of the league it could effect his score. One interesting note on fouls is that games involving The Crew have the most fouls. They are 1st in fouls suffered (but, 7th in conceded). Believe it or not Eddie Gaven is the most fouled player in the league. Chicago is 2nd in the league in aggressive play behind only Philly. So with this game between the Columbus and Chicago one could be certain in saying that there is a high probability the game will be more of a rugby match. This little tid-bit of info is important for the Crew because it means that they will be getting more chances on set pieces. Something I hope they worked on in training this week. They haven't been great with them so far. If we were to go with the old adage of: "past performance predicts future results" then I might be inclined to say that the difference in this game will be how well Columbus converts set pieces around Chicago's box. 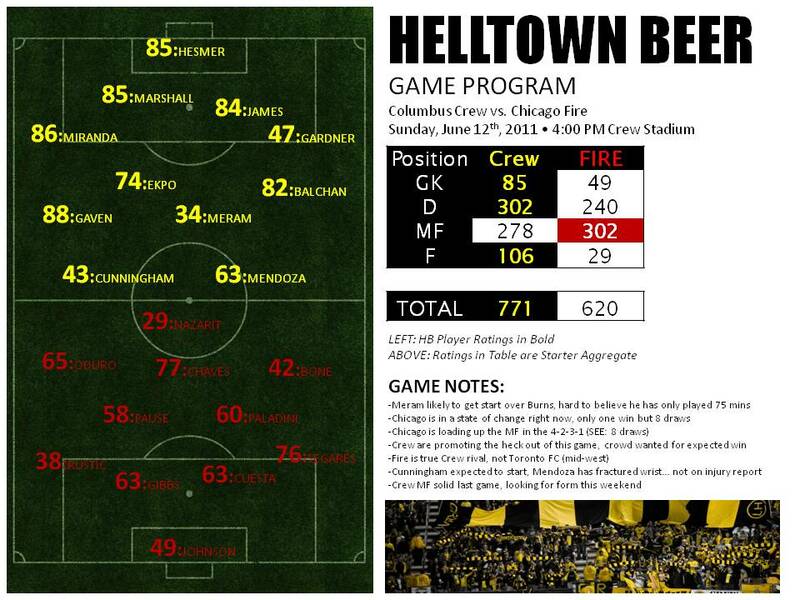 Let's say the game will go like this... MF battle because the Fire are loaded up there and Columbus MF is strong. Late in the game Gaven get's fouled 25 yards out. Mendoza (cast on arm) lines up... takes the shot directly on goal and... AND?